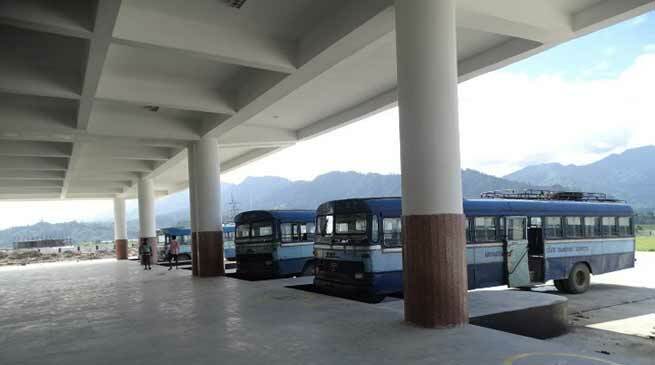 Even after inauguration of Interstate bus terminal (ISBT) at Lekhi on August 12, it is not functioning properly and all the long distances bus and night service are not yet being operated from the terminal. When enquired about the delay, APST Superintendent Gyamar Tadap maintained that though the ISBT have been inaugurated, the planning has not been completed yet and at the final stage. And at present only 19 APST buses are running. Tadap disclosed that government have taken a decision to operate all long distance and night super bus service as well as other services and the proposal by the Transport department is almost prepared and all provisions are there in the guidelines which would be approved soon and as soon as the guidelines is approved all the activities would be started. When asked about news circulating in social media about damaged Gypsum board and roof leakage at several places under ISBT, Tadap replied that he has no knowledge about the development, but assured that to repair it if damaged which occurred before inauguration would be repaired by Urban Development department. Tadap further appeal one and all to cooperate so that the terminal is fully funcctinal and ooperationalised for the greater interest of the state and people.